Great blog post from Kristina Halvorson that tracks Google searches for "social media" against searches for "content strategy." 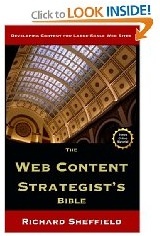 Exciting and well-documented conclusions that content strategy is indeed the next big thing. Adding content strategy to your process as a Web publisher is hard, messy, and time intensive. BUT it may also be the last big win in terms of increasing your site's effectiveness. Lord knows that we have tweaked the heck out of everything else. Dealing with your content issues is just about the only thing left to tackle. Just finished taking the A List Apart survey for people who make websites. Help A List Apart form a picture of the ways web design is practiced around the globe. They hope that making this data available will have a positive effect on best practices and employment, and will enhance public understanding of, and respect for, our profession.